Naomi was born at 38 weeks on April 3rd, 2014. My water broke the day before, while trying to help my husband install a new toilet. It seemed we had lots that was left undone from our move a week and a half before—lots of boxes and we hadn’t even packed to go the hospital. Quickly packed up the girls, and dropped them off at my Mom’s house. Delivery went well, but after seeing her, we had some initial thoughts that she has Down Syndrome (DS) but didn’t mention them to each other. My husband and I finally told each other our fears she has DS a few days after she was born. My husband ran to get the laptop and we looked up physical characteristics of DS and we noticed some things. Interestingly, the delivery doctor and nurses made no mention…and we brought it up with our family doctor, at a few days old, he just thought she had her own unique look…and then at 1 month, there was no referral, seemed a bit of a “wait and see” approach. The main concern at the beginning was her jaundice and getting her feeding more—she could go for maybe 9 hours sleeping and we tried everything to try to wake her up—vacuum, bath, kids screaming—and she would still sleep. Kept having thoughts about DS but didn’t want to really face them either. Kind of interesting the DS was overlooked by many medical professionals…but, in retrospect, maybe it was good–time to recover from delivery and I’m sure I needed time to process. 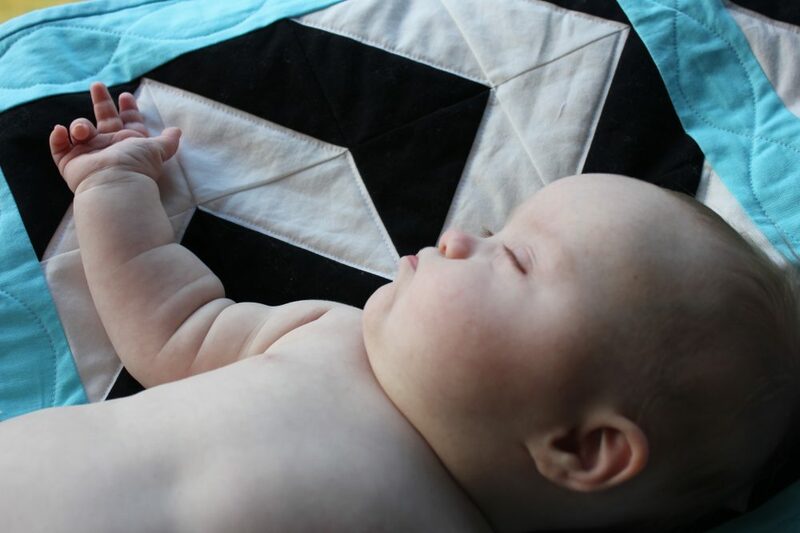 Finally decided to drive to Children’s Emergency on May 23 (at 7 weeks) since she was not looking great–pale and bluish around her eyes and under her nose especially when sleeping. My mom had remarked that she felt cold, maybe something with her heart? I had decided to look up some things and started to get worried–found out that up to 50% of children with DS have heart defects. Good thing we went to Children’s–they recognized DS and said her heart was working hard and her oxygen level was de-saturating during feeding. They referred us to a pediatrician who we met for the first time mid-June and he gave us the genetic results confirming our thoughts that she has Trisomy 21 (genetic cause for DS–3 copies of the 21st chromosome, instead of 2). By the time we got confirmation, it was hard to hear, but good to finally have some confirmation, we could now start to move forward to get the help she needs. After the first visit to Cardiology at Children’s, they were saying she would have heart surgery at 6 or 7 months…so in October or November…to give time for her to grow more…but all decisions are made as a team. We had our second visit to Cardiology and the Cardiologist said she would present Naomi’s case. She called mid-July to let us know surgery would be within the month. We were kind of shocked and worried, for a bit. Why so soon? Were there concerns that they wanted to do it sooner? Wrote an email wondering why it was going to be earlier, so they called again, said the Cardiologist expressed our concerns to the surgeon, and said it could be on Sept. 3rd or mid-August. Then, we were realizing it would be best to have this over and done with sooner than later. Waiting is hard. We preferred an earlier surgical date, as much as we would not want surgery to happen, but we know it is for the best. Sooner seemed better than later for a lot of reasons, then we can move on to the next steps. I will also have more time this summer since I have very little work to do for my jobs in home education. So, I wrote another email expressing why we actually now hoped to have this done sooner. Just this past week we got a call that Naomi’s surgery is planned for July 28th. Her pulmonary hypertension is on the severe end of the scale. Not sure if surgery will solve this problem completely– Cardiologist expects it won’t–maybe partially–lots of factors involved—sounds like there is medicine she can take to help. And, there could be other issues, but we don’t know at this point–waiting for referrals to a Respirologist and an Ophthalmologist, both at Children’s. Naomi’s sometimes not feeding that well right now–I think she was tiring out with the heat wave we had recently (glad the weather has changed for now), compounded by the heart/lung issues. She’s not gaining as much weight as they would like. About 13-20 grams/day vs. 30 grams/day. So, I go into the health unit every week to weigh her and sometimes meet with a public health nurse. Lots of medical appointments–at least one per week. This coming week there will be three. In the midst of all of this, definitely feeling God’s presence and love in all of this and that is a great source of comfort. He is sending Bible verses, people and other things at just the right time. Incredible support and prayer from family and friends–thank you!!! And, I’ve been “just happening” to meet other moms who have kids with DS–both who had to go through heart surgery–great encouragement. One mom is actually a nurse on nurseline…in the early days, I called 811 due to Naomi’s breathing rate…and she “just happened” to be the perfect person to talk to…she told me about her youngest son who has DS, went through heart surgery and is now ready to enter Kindergarten. She has been keeping in contact with me by email and we will likely meet up this summer. We have definitely had very hard days—this has been very difficult—lots of tears–my husband said he doesn’t think he has cried this much in his life—I don’t think I have either! But, in the midst of all of this, we have had some very beautiful moments too. “Just happening”s–divinely orchestrated appointments–thankful for them. Thankful also for prayer, phone calls, messages, and visits with family and friends. Thankful for friends and family who have supported us in different ways. Thankful for those watching Naomi’s older sisters so we could attend appointments and so I could get my end of year work done! Thankful for family members who have hatched a plan to keep Naomi’s older sisters occupied when they do have to come along to appointments (iPad minis)! Thankful my husband’s cousin/boss has given him time off from work for appointments! Thankful I have work as a teacher and the summer off! Thankful for family members who escaped to Manning Park with us at the end of June—we needed to get away! Thankful for family members who can share such positive words based on their work with kids with DS! Thankful for books about DS from family members! Thankful for family in Vancouver who are giving us a place to sleep during surgery! Thankful for family coming to visit and help us out (watching Naomi’s big sisters while we stay at the hospital)! Thankful for all who have prayed for Naomi and our family! Please feel free to continue to pray. Thankful for the elders from Coquitlam Alliance Church, where we had been regularly attending for the last 5 years before our move,who came to pray for Naomi on Friday. It was a very good time and my husband and I felt very blessed from that experience–praying for God’s will to be done—He will answer. Thankful for prayer, care and concern from the people at Silver Valley Church as well, where we have attended a bit lately since our move. Maybe God has chosen to heal her heart through a miracle, or maybe her heart will be healed through surgery. We trust in his best plans and will just pray for His will to be done. This one was at the Vacation Bible School that Naomi’s older sisters attended recently at the High Way Church in Maple Ridge. “Just happened” to meet a mom there who showed the chest scar from her 2 year old’s heart surgery. Her daughter also has Down Syndrome. Great to talk to a mom who has “been there”. She offered tons of support. And, these encouraging words Jesus said were on my mind a lot. I “just happened” to read it in the Today devotional that is emailed daily. Heard it in a sermon we heard recently at Coquitlam Alliance Church and in a song at Silver Valley Community Church this past Sunday as well. And, this verse from our wedding has been meaningful during this time. Here is an inspiring story that we watched the other day from ESPN “E:60 – Perfect”. I had “just happened” to watch this a while back on Facebook, before all of this, and Matt let me know it was on television just a few days ago, so we watched it together. About a Dad coming to accept and love his daughter with DS—very inspiring—grab your Kleenexes! Here’s a story that I’ve been finding a lot online and in books about Down Syndrome. I “just happened” to pick up an unrelated book on my shelf the other day, and found this story again. The author has a son with Down Syndrome. c1987 by Emily Perl Kingsley. All rights reserved. It’s just a different place. It’s slower-paced than Italy, less flashy than Italy. But after you’ve been there for a while and you catch your breath, you look around…. and you begin to notice that Holland has windmills….and Holland has tulips. Holland even has Rembrandts. I “just happened” to find this one when Naomi was only a few days old. They also received a diagnosis after birth. This boy and his family are doing amazingly well. Very inspiring. We sang this worship song at our wedding. “Blessed Be Your Name” based on Job 1:21. Meaningful at this time. This entry was posted in Uncategorized by mtb1976. Bookmark the permalink.